Rail began in North Bay with the arrival of the CPR's "Lucy Dalton", the first passenger steam train, on November 9th, 1882. Lott Britton, the grandfather of Britt Jessup, editor of the North Bay Nugget , was its fireman. 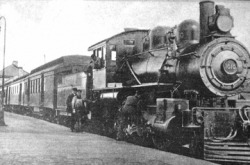 The Northern Pacific, from the south, later the Grand Truck, becoming the CNR in 1922, met the east-west CPR at Callandar in 1887 at Nipissing Junction. The Canadian Northern, operating east-west from Pembroke to Capereol, passed through North Bay in 1915. It also became part of the CNR in 1922. The T&NO (Temiskaming and Northern Ontario) was a provincial government railway started in 1902 with head offices in North Bay. Its purpose was to "open the north" to settlement, never knowing the mineral finds of Cobalt in 1904, Timmins in 1910, Kirkland Lake in 1912, and Noranda in 1918, would create development beyond their wildest dreams. The final leg from Cochrane to Moosenee was completed in 1932. In 1946 the T&NO was renamed the ONR (Ontario Northland Railway). Thus, due to its strategic location, North Bay bacame a divisional terminus for three major railways unique in Canada, the CNR, CPR, and ONR.